It is not showing anything when I'm typing on the address bar in opera, though it is working. It is very annoying. Can anybody please help me how to turn on the option. Your browser version - in case it matters? Would you mind a screenshot? Problems with other menu/text areas? 2> Don't mind a screenshot, even already saved in paint format but how to upload the file??? 3> No problem in other areas, only nothing is visible in address bar area. Upload it to a image host service and post the link here. Describe your course of action. Does it already look so when you have only just opened the browser? a new tab? What are you trying do undertake exactly and what happens? Did you do an ordinary install without any custom changes? Do you have any peculiar fonts installed on your system and/or have you added any extensions to the browser? yes even when new tab are opened. when I am typing something on the address bar nothing is visible even the cursor is not blinking or the text of address bar I can't copy, it is showing nothing. It is an ordinary installation which I did a month back it was alright at that time, then it took a automatic update 3-4 days back and after that I noticed the Problem. No special fonts installed or have any extensions to the browser. Is there any way to go back to the previous version. Thanks for your concern, but I'm not doing any such things. And upon the browser start-up? Or do you use "start when I left off"? Otherwise - does it work? It is only invisible but is there? Can you type and go? paste and go? copy the address that it's pastable elsewhere? Tried in the private mode? I'm having the same issue when the high contrast theme of windows is active. It is like if the background and the text of the address bar was all in black. It works fine when I select a default windows theme. I'm having the same problem. Have checked "Show full URL in combined search and address bar" and still nothing. When I paste something in the bar, a google bar pops up to do a search. Are you using Windows native theme? What happens if you change it? Thanks all for helping. It was happening only due to the desktop picture. My desktop picture was a Hi-def photo taken by me but when I changed it to widows own desktop theme everything was perfect. I requesting Opera to look at it as this is a bug and they should check and rectify it. Special thanks to "leocg" he suggested this trick, first I didn't find any logic behind it but still tried and it worked. Hi @rupak22, you can report it by yourself, through the "Opera bug report wizard". I changed my desktop image and that fixed it!! I have the same problem as Rupak, have tried the same fixes as Rupak, yet the problem persists: blank address bar and all other menu/text bars. I can rightclick mouse in those bars, hit copy, and paste into WodPad, and the text that couldn't be seen or highlighted in the menu/text bars will paste (be seen) in WordPad. I've uninstalled Opera, run CCleaner, shut down computer, and reinstalled Opera twice, changed the Speed Dial theme 3 times, changed the Win8.1 desktop theme several times, and changed the Win8.1 background/text colors several times . . . all without resolving the issue. I didn't have this issue with Opera + Win XP or Opera + Win 7. 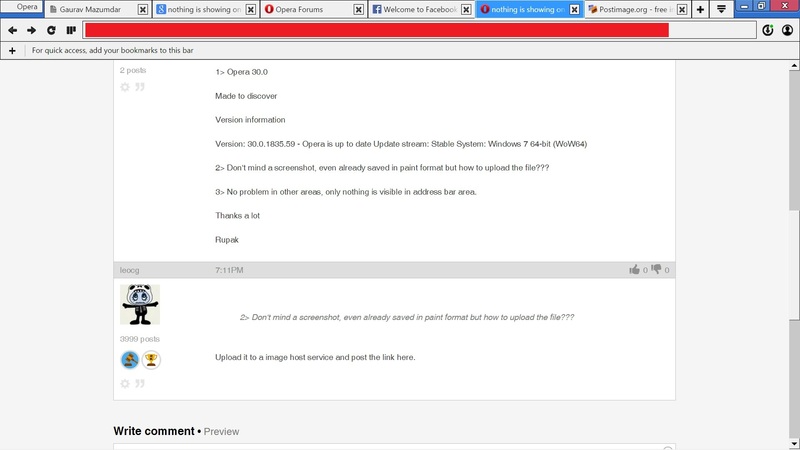 Do you think this is an Opera issue or a Win 8.1 issue? To whom do you think this issue should be addressed? Morph, your problem might be related to a certain weird font installed on your system. Ever heard of Blank font? Make a system search for it, unless you already know where it is - if it is.